Ford is constantly looking for ways to improve their vehicles. In order to provide more assistance for drivers of Ford vehicles, Ford is introducing a suite of driver-assistance technologies that they are calling Co-Pilot 360. Many of the new Ford models at Ford of West Covina feature Co-Pilot 360. One of the features that you will find in this system is the blind spot information system. 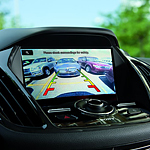 The system monitors the blind spot on either side of the Ford vehicle. If a vehicle is detected in the blind spot, the driver is alerted by an illumination appearing in the side mirror. Ford's Co-Pilot 360 also includes the lane keeping assistance feature. When the system detects that you are moving outside of the lane markings, you will receive a warning. The steering wheel will vibrate, and you will hear an audible alarm. The system will attempt to steer you back into the middle of the lane.